My heart rate went up a notch when I boarded the sleek new catamaran in Lucerne at 7am. Sailing across the satin lake into the sunrise on a glorious spring day, I watched the silhouette of my destination, the iconic ridge-top Bürgenstock Resort, take shape on the horizon. A favourite of Audrey Hepburn, Sophia Loren and husband Carlo Ponti, Charlie Chaplin and countless other celebrities in its 1950s to its 1970s heyday, the resort has been reborn after a massive reconstruction project. I could also make out the tower of the famous Hammetschwand Lift, built at the beginning of last century by the resort’s original owners. An astonishing engineering feat, the tower still holds the distinction of being the highest outdoor elevator in Europe… and the fastest. I could have arrived at the resort by helicopter or plane, but zipping across the lake on this magnificent $6 million, state-of-the-art luxury catamaran was a stylish way to travel – it also allowed for the building of suspense and a delicious sense of anticipation. Commissioned on May 26, the gleaming white, all-aluminium catamaran is a beauty. Designed by Judel/Vrolijk & Co from Bremerhaven, one of the world’s most respected yacht designers, the 37m hybrid vessel operates on both electricity and diesel. She carries 300 passengers on two decks with interior and exterior seating, and runs hourly, year-round, from 7am until midnight. By the time we docked at the Bürgenstock jetty 25 minutes later and I gazed skyward at the resort, looming 500m above me like a sprawling castle, I was in a state of high excitement. But my Bürgenstock adventure had only just begun. An elegant liveried footman met me at the jetty, took my luggage and delivered me to the resort’s shiny red new funicular which first began carrying celebrity guests up the steep incline in 1888. There’s quite a story behind this remarkable piece of engineering. The first owners of the resort, hospitality pioneers Franz Josef Bucher-Durrer and Josef Durrer, were granted the concession to operate an electric funicular railway on the Bürgenstock in 1886 and secured a building licence a year later. Construction to install the single-track up the steep, rocky terrain took two years. Opening in 1888, the 943m-long railway accommodated 40 passengers in two carriages and travelled at a speed of three feet per second. Additional technological updates took place in 1928, 1980, and 2001, and in February 2016, the Bürgenstock Resort began to construct an electro-mechanical installation for a new funicular following the original track. Today, the CHF15 million (US$15m) cableway has a carrying capacity of five tons, travels at 10ftt per second, and is able to operate in all-weather conditions. Shuttling back and forth on the new superstructure, the carriages are exact replicas of the originals and can accommodate up to 80 people each. Displays in the waiting room-museum at the lower terminus tell the fascinating story of the funicular with a historic timeline of the resort, the old carriages, vintage suitcases and other artefacts. The trip up the near perpendicular slope was breath-taking as the landscape unfolded below: tranquil Lake Lucerne, lush green pastures populated with plenty of cows, and the cable-cars on Mt Pilatus and Mt Rigi glinting in the sunshine. Then, all too-soon, the funicular deposited me inside the spectacular new 10-storey, five-star superior Bürgenstock Hotel & Alpine Spa. 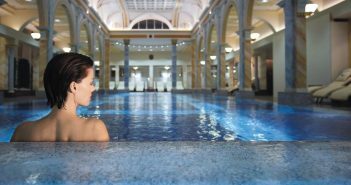 Widely described as ‘the project of the century’, the reopening of the 145-year old resort, after a nine-year construction and renovation project valued at around CHF 550m (US$550m), is one of the most significant hotel openings worldwide in the past 12 months. It was still early in the day so after checking into my splendid suite overlooking the lake, I headed up the Felsenweg Pathway for my third Swiss transport thrill of the day, the Hammetschwand Lift. Built between 1903 and 1905 at a cost of CHF500,000, the Hammetschwand Lift was a technical masterpiece of the Belle Époque. It was the fastest elevator in Europe and is still the continent’s tallest outdoor elevator at over 153m. The base station lies 961m above sea level and the upper station is 1,114m above sea level. The Hammetschwand was modernised from 1990 to 1992, making it wheelchair accessible and faster at 3.15m per second, (almost 10ft per second). With large glass windows on three sides, the cabin offers spectacular panoramic views of Lake Lucerne and the surrounding Swiss Alps. Today, the lift accommodates 12 people and transports more than 40,000 passengers a year. The audacious project to construct the Felsenweg and Hammetschwand was described as ‘a perilous undertaking’ for the experienced miners from Austria and Italy who worked at the site from 1900-1905. Back then, the lift was known as ‘Switzerland’s Eiffel Tower’. The glass capsule whisked me up the cliff face in seconds to a viewing platform with a jaw-dropping 360-degree panorama. In one direction, lay Lake Lucerne, Mt Pilatus, and Mt Rigi, and in the other, a horizon crowded with snowy peaks including the 4,000m-plus Jungfrau, Eiger, and Mönch. My curiosity sated, I took the long way back to the resort following one of many scenic trails that criss-cross the 60-hectare property. Bürgenstock Resort’s Alpine Garden… what views! The sheer size of the Bürgenstock Resort is mind-boggling. 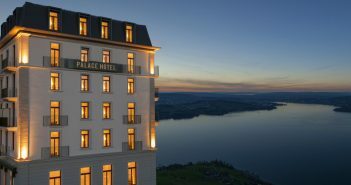 It encompasses 30 buildings with 383 luxury rooms and suites spread across four hotels: the five-star superior Bürgenstock Hotel & Alpine Spa, the four-star superior Palace Hotel & Conferences, the five-star Waldhotel Health & Medical Excellence Hotel with a Health & Medical Center; and the three-star Taverne 1879. In addition, the resort boasts 67 residence suites, eight restaurants and bars, the 10,000 square meter Alpine Spa, a cinema, conference facilities, ballrooms, wine cellars, event domes and boutiques. The resort also has indoor and outdoor tennis courts, the latter converting into an ice skating and curling rink in winter, a nine-hole golf course, 70km of hiking, horse-riding and biking trails, and a private lake-based lido for water sports. The Bürgenstock Resort Lake Lucerne is part of the Bürgenstock Selection headquartered in Zug, Switzerland. The portfolio includes the Bürgenstock Hotels & Resort Lake Lucerne, the Schweizerhof Hotel & Spa Bern (99 rooms) and the Royal Savoy Hotel & Spa Lausanne (196 rooms). The total investment of the Bürgenstock Selection is one billion Swiss francs. You can watch an excellent video of the Bürgenstock’s new ferry on Luxury.TV.